To kick off the 2014-2015 season, we have released new versions of our GrandPrix Race Manager (V14.0), RaceFX (V6.0), DerbyDMV (V7.0) and RaceReplay (V4.0) software. GrandPrix Race Manager and DerbyDMV have a new wizard to help you create your race groups and subgroups and a new wizard to import racers, awards, and chart data. GrandPrix Race Manager and RaceFX can now be interfaced together to play a random sound effect at the start of a heat and/or the end of a heat. RaceFX can now play just a portion of a sound effect file. You can even adjust the volume level of individual sound effects. RaceReplay can now do a full screen replay on one monitor while you do other tasks on the other monitor. We've also released a series of instructional videos that will help guide you through using GrandPrix Race Manager. There are also videos on interfacing GrandPrix Race Manager with RaceFX and RaceReplay. If you have any questions or comments, please feel free to email or PM me. We've managed to squeeze in one more feature into GrandPrix Race Manager Version 14, support for Derby Timer brand timers. 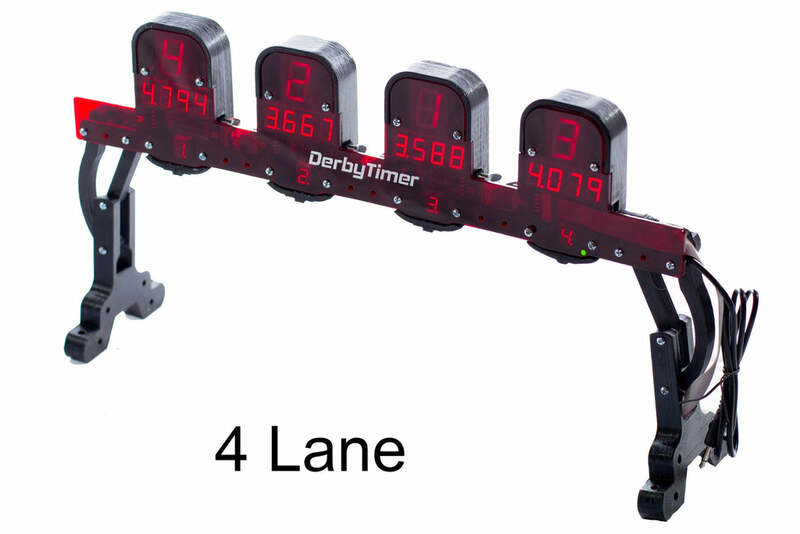 They've got some very nice 1 - 4 lane dual sided timers. If you have already installed GPRM V14, there is an update available that adds in that support.